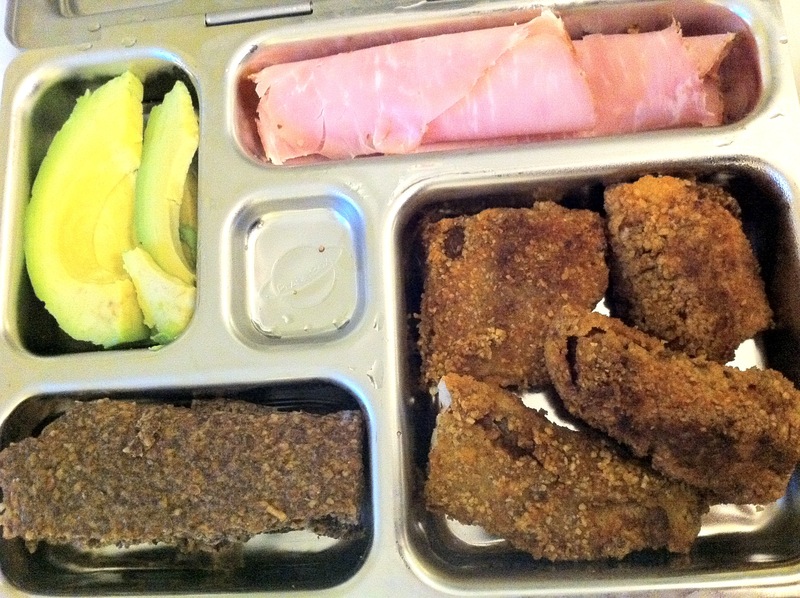 Adult Lunch Box: Paleo Fish Sticks! Ever since I went back to school, my husband has been the chef of the house. He’s recently been experimenting with almond flour breading for chicken and fish. Last night he made absolutely delicious fish sticks with Perch from our local Farmers’ Market. They were so satisfyingly crunchy with a hint of spice to give them a more ‘adult’ flavour. The best part of these fish sticks is that they were just as delicious eaten cold at lunch today as they were right out of the oven last night! Today’s lunch box was somewhat depressingly bland, colour-wise, but it was one of the yummiest lunch boxes I’ve had in a while. Sunflower & Flax Seed crackers from the Farmers’ Market – I will miss these crackers SO much when the market ends for the season. They are A-M-A-Z-I-N-G and they make both raw vegans AND Paleo eaters happy! *note that I made mini ‘sandwiches’ using the crackers, ham and avocado at lunch time today. Crunchy and creamy! 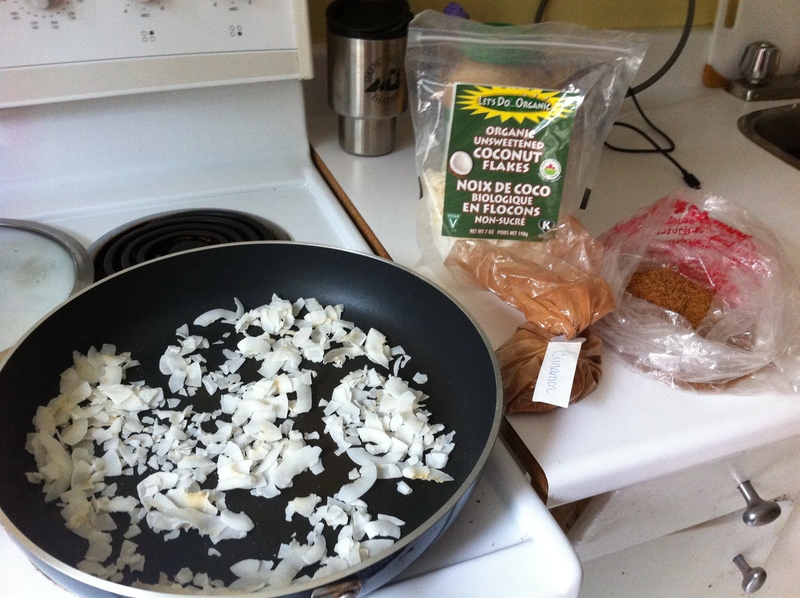 Leftover Paleo Fish Sticks – if anyone is interested I can get the recipe from my husband and do a photo blog of how he prepares them next time he cooks. Is this of interest to anyone out there? While we wait for the arrival of the new lunch box we ordered for my daughter, I thought I’d share a recipe. Since my daughter’s school has a nut-free policy and avocado is messy when you’re three-and-three-quarters and eating snack on the floor with your friends and are FAR too distracted to find the napkin that your mom packed for you, I have been struggling to find good FATS to pack in her lunch lately. I determined that COCONUT was the way to go to get her some healthy fats at snack time, but my daughter has never been a big coconut fan. Last week I tested out Clean Eats in the Zoo‘s version of The Clothes Make the Girl‘s Caramelized Coconut Chips. I loved them. My husband loved them. We ate an entire batch over the course of a Saturday of family errands. My daughter…ate a few. A minor victory, but not enough for me to start sending them in her snack box. I decided to modify the recipe to be a bit more kid-friendly (my daughter being a kid with a sweet tooth). Scoop your handfuls of coconut flakes into a frying pan (no need to grease the pan). Turn the stove on to Low-Medium heat (about 4 or 5 on the dial). Once you start noticing the tiny pieces of coconut browning, start moving the flakes around with a wooden spoon. Once even the larger flakes start browning, toss your palm sugar and cinnamon in and stir it all around for a minute or two. Be careful that the tiny coconut pieces do not start to burn! Pour your concoction out onto a plate and let cool so that the chips can harden. Ta-Da! 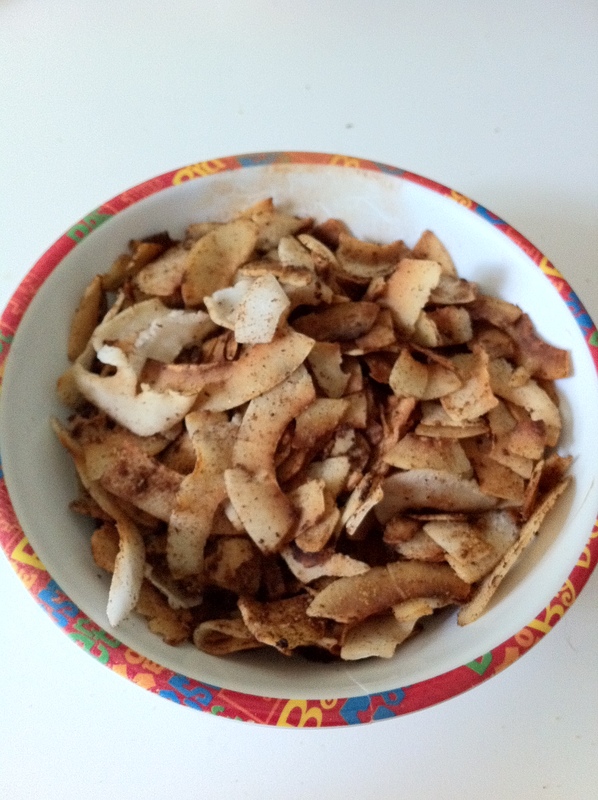 Kid-approved, only a tiny bit sweet COCONUT CHIPS! If my daughter is a fan, I’m going to go ahead and guess that even your picky eater will be a fan. I got some very sad news at daycare pick-up the other day. My daycare provider, who picks my daughter up from school three days per week, informed me that she needs a new lunch box. Turns out her Planet Box was just too heavy for a kindergartener to carry around and her teacher had mentioned to the sitter that she’ll need a new one as the children are responsible for carrying their own backpacks. Obviously I was extremely disappointed. My Planet Box has helped me stay pretty darn Paleo in spite of a gruelling academic schedule over the past 12 months. I was hoping it would be just as successful for my daughter. I have decided to give plastic Bento-style lunch boxes a try for the year, and we’ll try the Planet Box again next year when my daughter is a year older and that much stronger! After much research and debate, I have decided to order the Laptop Lunches Bento Box. I will report back once it arrives and my daughter tries it out for a few days. And, of course, I’ll post pics of her Laptop Lunches! It was my first day back. It was a short day. I over-indulged all weekend at a family wedding celebration. I kept it simple and tasty. No cooking required. 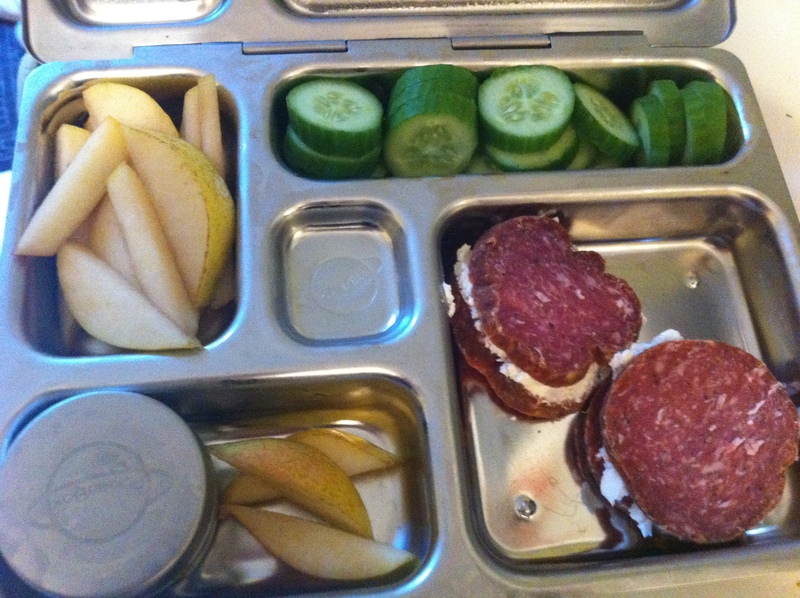 Summer Sausage & Garlic Goat Cheese mini-sandwiches – what I do with these is take them apart and eat them open-faced and topped with baby cucumber. YUM! See? Simple. The kind of simple that anyone can implement after a weekend away (where we missed our chance to hit the market and didn’t even make a run to the grocery store!) that still hits all your protein, fat and some carb-goodness :). Today’s Snack Box was 100% designed and implemented by my almost-4-year-old! As soon as we got home from home care after her first day of school (!!!) we headed straight to the kitchen. She helped me wash out her Planet Box and then opened the fridge and cupboard and selected the contents of tomorrow’s box. The whole thing took about 15 minutes, and it was a great opportunity to spend a little bit of quality time together after her super busy day. Baby Cucumber – again, she insists they taste better whole; these baby cucumbers have taken the place of granola bars in our household…they’re not terribly filling (but neither are grain-laden granola bars), but they really are satisfying to crunch away at when water won’t cut it! I have a feeling the raisins are here to stay for a while. I’m hoping to find a way to ‘sneak’ egg yolks into her diet soon. That’s my next research project :). The day is here. She starts Junior Kindergarten tomorrow at 8:45am. 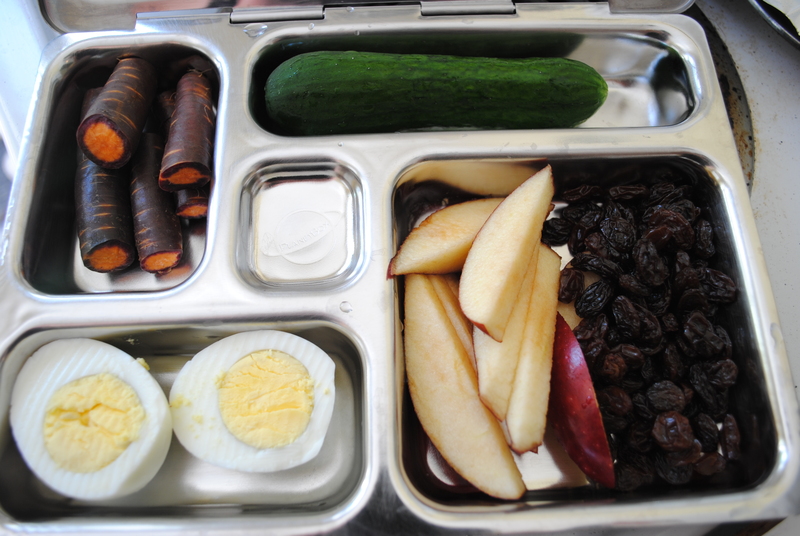 In Canada, there is a NUT FREE policy at the schools, which makes packing a filling Paleo lunch box challenging. However, since she is only in half-day school this year and next, the school asks that we pack them a snack, rather than a full lunch. So my kiddie lunch boxes this year will all be SNACK BOXES. My adult boxes will still be LUNCH BOXES. I start back next Monday and I have a few ideas for this year’s boxes with KEEP IT SIMPLE as my motto for the year :). 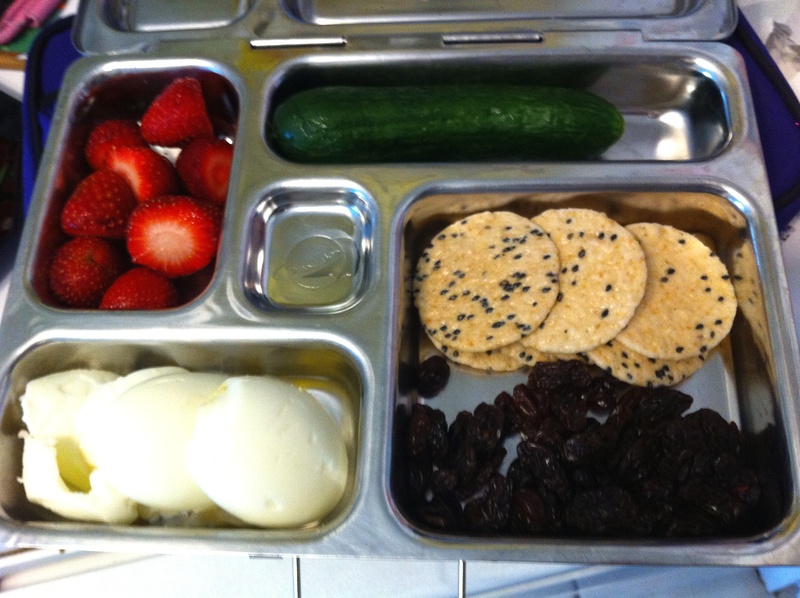 This Snack Box was inspired by a picture out of Sarah Fragoso’s children’s book Paleo Pals. My daughter was flipping through the book this morning while I was packing her bag up and insisted that her first lunch box look like the one in the recipe section of Paleo Pals :). Purple Carrots – my daughter HATES carrots; she LOVES purple carrots (which taste EXACTLY the same). I suspect it will be a long carrot-free winter as the purple ones seem to only be available at the Farmers’ Market, which ends in October. As you can see, this isn’t a terribly filling box. However, school is only 2.5 hours long and she’ll have lunch at her home care shortly after school, so this box provides her with snack options that are tasty and appealing enough to her that she can snack on stuff in her box throughout the day. And it’s nut free!